Why won't trappers put up warning signs? There must have been some trappers in folklore, long ago, who learned that whenever they put up warning signs, their traps were stolen. Since then, every trapper has said "no" to warning signs. This is despite the strict law of the State of Minnesota and the heavy penalty (about $700) that can be assessed for tampering with a trap. So when a trapper refuses to put up warning signs, and insists instead that the only way to keep dogs safe is for dog owners to follow leash laws (or else! ), he's putting a lot of faith in the leash laws, but none in the trap-tampering law. That's convenient for the trapper, but not really fair to anyone else using the area for other forms of outdoor recreation. Try to get a trapper to discuss warning signs sometime. See how long the conversation lasts and how it ends. Hints: 1) it won't last long, 2) warning signs will be declared "impossible," and 3) responsibility for protecting dogs from traps will be shifted from trappers to dog owners. Only one of these two signs should apply to any given area. Isn't a sign just an invitation for 'antis' to tamper with my fur and traps? There is value to the outdoor-recreation community in having signage at entry points and boundaries of multi-use outdoor-recreation areas. This blog entry was added to the "signs" FAQ on 1/10/2016. Every time a dog is hurt or killed in a trap, a dog owner will suggest putting up signs to warn dog owners that the area is being trapped. And someone from the trapping lobby will repeat the old trappers' complaint that "putting up a sign would be just like putting up an invitation for the 'antis' to tamper with my traps and fur." Although some will deny it, there's a middle-ground between these two positions. North Dakota Game Warden posts a sign at an entry point to a Wildlife Management Area (WMA). The signs above and below show some of the ways that public and private land managers communicate with the public about which forms of outdoor recreation are approved in each area. Some of these signs only identify the type of area (e.g. Wildlife Management Area, or WMA) for which a set of regulations has been published by the State. Others provide a summary of important regulations. Others list the regulations in detail, right there at the trailhead, along with maps and self-guided tours--geeks rejoice! Signs at trailheads and land boundaries invite certain activities and discourage others. They reduce conflicts between potential users of multi-use recreation areas. For example, if it's grouse-hunting season and people are out with their hunting dogs--or if dogs are allowed to run off-leash in the area--trappers may be required to avoid sets that could harm or kill dogs. If it's deer-hunting season, hikers and bird watchers might want to avoid the area, or dress in blaze orange, and avoid brushy areas and shooting lanes. If it's a designated trapping season, dog owners might want to avoid the area, or keep their dogs on short leashes (and watch every step!). Without signs--or in the absence of commonly-accepted rules in residential or recreational areas--disagreements and conflicts may arise. For example, trappers might see signs of furbearers in an area, and want to trap there. On the other hand, neighbors might want to walk their dogs safely in the area. Where those two uses are incompatible, they should not be approved in the same area (or even on adjoining areas, since dogs tend to be attracted to trap lures and bait from considerable distances). Otherwise, where incompatible uses are allowed, conflicts will arise. In disputed areas, trappers will choose to continue trapping. They might try to hide their traps so that people won't tamper with them, but they won't be able to hide them from the dogs. A trap can't be hidden from a dog. Unless precautions are taken by the trapper and/or the dog owner, a dog will follow the scent and end up in the trap. And although there are proven ways to trap without endangering dogs, not all trappers are willing to use them. Every year, in areas where trappers assume it's okay to trap and dog owners assume it's safe to let their dogs run off-leash, dogs are caught, injured, and killed in traps. Signs have the long-term potential of resolving conflicts like this. If everyone knows an area is being trapped, trappers benefit from reduced tampering, and dog owners benefit by knowing that they should avoid the area. If people are likely to tamper with traps in a given area, then the trapper might want to reconsider his methods, or his use of that area for trapping (see Trapping Ethics: use of appropriate sets in areas of high human or domestic use). Take a look at the signs below, and see how well they do their job of letting everyone know what the rules are. See whether they address the old trappers' complaint that "putting up a sign would be just like putting up an invitation for the 'antis' to tamper with my traps and fur." The second row of the sign is a set of icons representing allowable uses. Louisiana: sign in the shape of the State: Dept. of Wildlife and Fisheries, Point aux Chenes WMA. The regulations for WMAs are published online and in fishing, hunting, and trapping regulations handbooks. Louisiana: antique sign "Wildlife Management Area. No guns, dogs, or traps allowed without permit. Louisiana Wildlife & Fisheries Commission." The regulations for WMAs are published online and in fishing, hunting, and trapping regulations handbooks. Image credit: ebay seller (no longer listed). 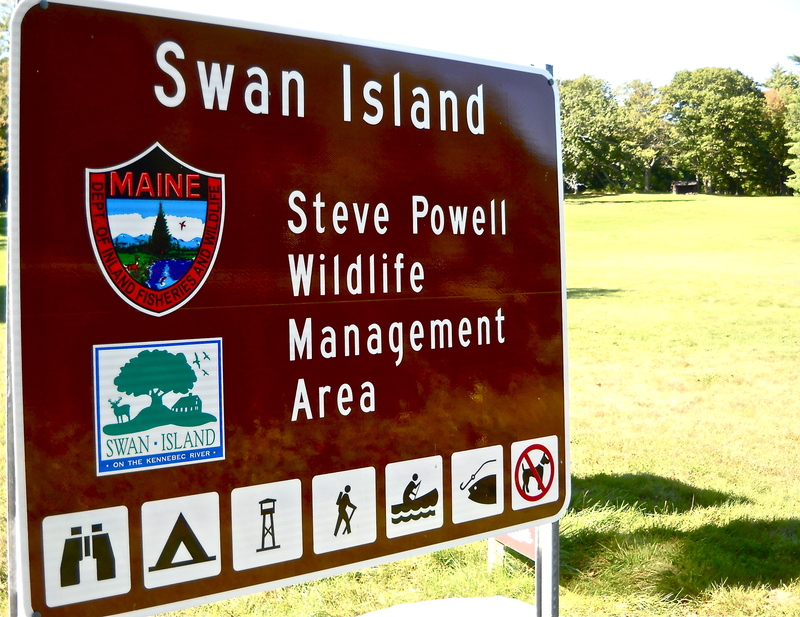 Maine: trailhead sign for Swan Island / Steve Powell WMA. The bottom row of the sign shows a set of icons representing allowable uses. 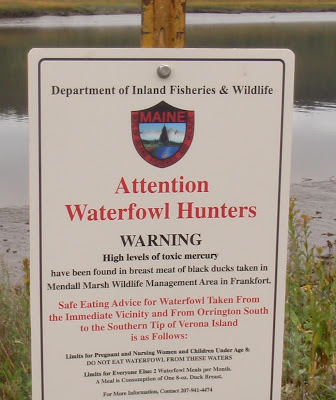 Maine: sign to warn waterfowl hunters of potentially high mercury levels in the game. It's an example of how specific a warning can be for a particular area. North Dakota: two-part sign identifies a PLOTS area with additional instructions on the bottom sign. Tennessee: Bark Camp Barrens WMA. Four-part sign shows how much text is sometimes displayed at a trailhead to describe allowable uses in the area. Virginia: G.R. Thompson Wildlife Management Area. Kiosk provides display space for multiple information panels, with room to spare for special-event notices, etc.